All transactions are safe and secure with a reliable history in online purchasing behind each of our associates. 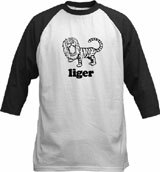 Buy the Liger shirt to own Napoleon Dynamite clothing and merchandise. These liger Napoleon Dynamite t-shirts feature an image of Napoleon's favorite animal, the liger. In the movie, Deb questions him about the animal after she sees him drawing one in his notebook. He explains to her, a liger is "like a lion and a tiger mixed... bred for its skills in magic." The design on these liger shirts features an image of the animal roaring, complete with a mane and diffuse stripes. In addition to the Liger tee above, browse the Napoleon Dynamite Clothing Gallery for more apparel like men's and women's clothes, kids shirts or hoodies.